The jobs picture isn't getting better, according to the Bureau of Labor Statistics. The private sector only added 71,000 new jobs in July but the overall economy lost 131,000, thanks to the loss of Census positions. Unemployment remains at 9.5%. Despite these less than stellar numbers, some experts say there's some reason for cheer. Of the 12 sectors that job website Indeed.com posts in, 11 are growing, including transportation and manufacturing. And although health care was down by 2% year over year, it remains the one with the most openings. Ian Malkasian, a photo assignment editor for The Oregonian, is one of those who decided to go into health care, becoming an oncology nurse. It took two application cycles before he got into nursing school but he's happy he did it. He shares his experience of taking small steps toward his new career goal. Ian Malkasian landed his dream job as a photo editor at The Oregonian soon after graduating from the Missouri School of Journalism in 1998. Yet, by 2002, he was restless, looking for "something to feed my soul," he told WalletPop in an e-mail interview. He took a National Outdoors Leadership course in the Yukon Territory, during which he backpacked for 28 days, learning survival skills like how to read a compass and how to administer first aid. A fascination with first aid led to a Wilderness Medical Institute Wilderness First Responder course, then EMT courses at a local community college and eventually volunteer work with the Mt. Hood Ski Patrol. Talks with paramedic friends got him thinking about nursing school. "I was tentative at first," he recalled. "I was making some good money, had a mortgage and was comfortable in my life. This was a huge decision and I didn't know how I was going to make it happen." Malkasian, now 39, made it a reality one step at a time. He slowly "chipped away at the prerequisites at night school," he remembered. By the time he quit his photo-editing job in 2008, he had married and had applied to nursing schools twice, finally getting accepted by the University of Portland School of Nursing. 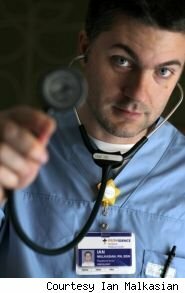 "Nationally there is a nursing shortage, but the bottleneck, it seems to me, is at the nursing school level," he said. "Schools can be very, very picky and there are 10 times as many applicants for every student who is accepted." He is now working as an oncology nurse at Providence Portland Medical Center in Portland, thanks in part to a three-year commitment he made with Providence Health & Services in exchange for two years of tuition, totaling more than $60,000. He and his wife Faith also learned to live on her salary as a photographer at The Oregonian. "Choosing nursing is choosing to serve," he said. "Occasionally I get asked, 'Why didn't you go to medical school instead of nursing school?' Medical school is ideally suited to those who want to 'fix' people. As a nurse, I want to 'serve' the patient." He continued, "Nurses who serve recognize the whole patient and not just the pieces that are broken. This is the holistic approach of nursing and why I'm drawn to it."